Live like a Parisian in the most charming area of Paris. The apartment is located in a very safe district. Walk 100m up and you are at the Sacré Coeur. Walk 100m down and you have all the shops and fancy restaurants. It is 100 m away from the Montmartre vineyards in a quiet street . We are at the beginning of the stairs leading to the Sacré Coeur. 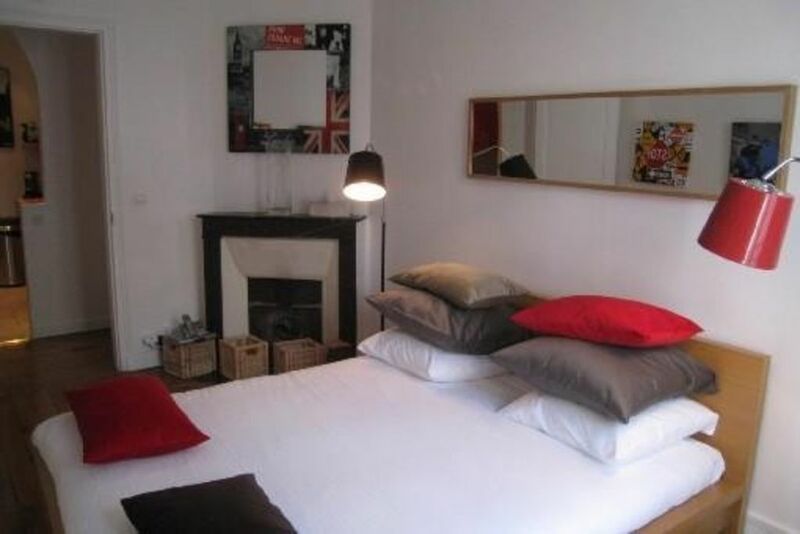 The two apartments are located in a quiet and typical Montmartre dead end. They are situated at the 3rd and 4th and floor of a small and typical Montmartre building. The building is very quiet (few cars in the dead end) and very sunny. At spring time you only hear the birds. We had a great 3 day visit to Paris. We are a family of 5 and had enough room to be comfortable in this apartment. Like most Paris apartments, it is modest in size, but enough for our needs. We were out and about sightseeing most of our time and the apartment is in a nice location from which to explore. The Metro is nearby and the Montmartre neighborhood is a cool place to stay. We had a wonderful 3 days in Paris. The apartment was ideal for our short stay. We survived the hot day of our arrival and wandered around Sacre Coeur area. We spent a day around the Tulleries, Musee D'Orsay, Notre Dame and Sainte Chapelle. We discovered the delightful local restaurant "Les Ambassades" - what a find; we went there for two evening meals - Good food, good service, lovely Madame. We are looking forward to returning in the not too distant future. There is no place more romantic than Montmartre. Look at the map and notice that the apartment is ideally located to discover Montmartre while walking: Sacré Coeur, vineyards, the "place du Tertre", The "Abesses" area, the Lepic street and the coffee of Amélie. I've been living in Paris for 40 years. I'm currently living in the 9th arrondissement with our 3 daughters (Opéra) but it's still a very particular feeling every time I walk and have fun when trying to lose myself in Montmartre. Montmartre is a village in the city. Out of time. As if time had stopped. You need to live there to understand that such unusual atmosphere. Wonder in the streets as if you were in San Francisco, step up the stairs, discover the houses, the vineyards, the narrow streets and the corner shop owners. It is also perfect to visit Paris by walking. 100m way, you will find the Lamarck Caulaincourt station, line 12. You are 10 min away from Concorde and 15 min from St Germain des Près.